Metastasis, the spread of a disease-producing agent (such as cancer cells) from the primary site of disease to another part of the body, has been associated with approximately 90% of cancer related deaths. Therefore, it is the single most significant challenge to management of the disease. The metastatic process involves migration of cells away from the original tumor (many times in response to a particular regulatory factor), followed by invasion into surrounding, or sometimes distant tissue. 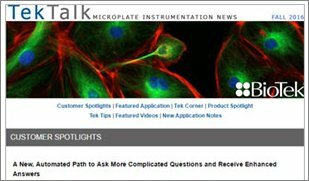 While many methods exist to measure the migratory and invasive characteristics of cancer cells, the advent of permeable supports has provided a simple in vitro approach to performing these types of assays. 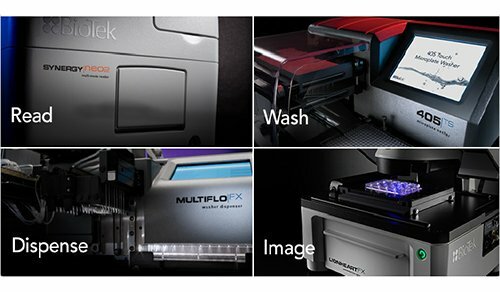 The addition of a fluorescence blocking membrane improves the accuracy of the assay, and allows the use of inverted fluorescence microscopy for analysis. 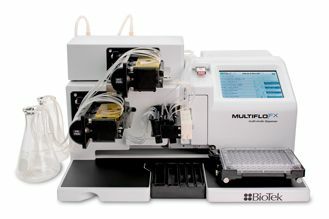 This provides the ability to accurately count the number of cells reaching the bottom of the membrane instead of relying on PMT-based measurements, which are more vulnerable to background fluorescence. 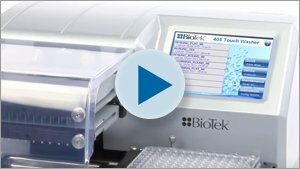 Here we demonstrate the ability to monitor cell migration and invasion using a novel cell imaging multi-mode reader. 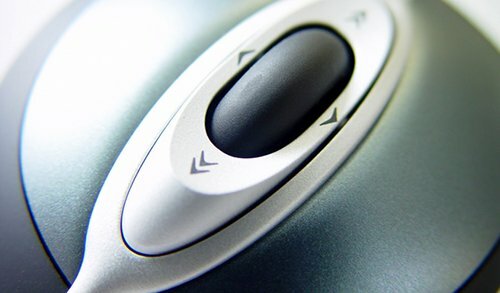 Kinetic imaging was carried out through the use of temperature and atmospheric controls. Cell counts were also performed using the Cellular Analysis capabilities in Gen5 Data Analysis Software. 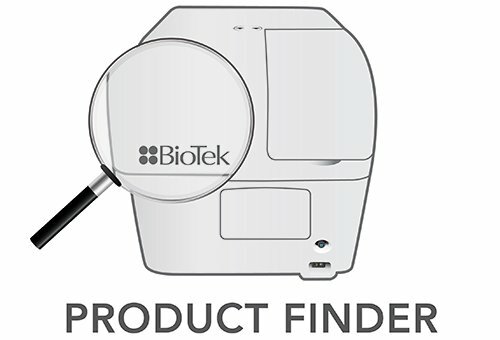 MDA-MB-231 RFP cells (Catalog No. AKR- 251) and MCF-7 GFP cells (Catalog No. AKR- 211) were purchased from Cell Biolabs, Inc. (San Diego, CA, USA). 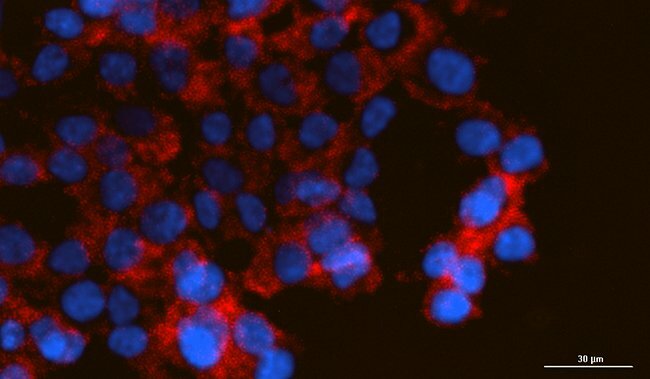 The MDA-MB-231 cells were propagated in Advanced DMEM Medium (Catalog No. 12491-015) plus Fetal Bovine Serum (FBS), 10% (Catalog No. 10437-028) and Pen-Strep-Glutamine, 1x (Catalog No. 10378- 016) each from Life Technologies (Carlsbad, CA, USA). The MCF-7 cells were propagated in MEM α Medium (Catalog No. 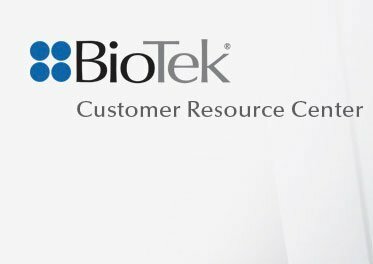 12561-049) plus Fetal Bovine Serum, 10% (Catalog No. 10437-028), Pen-Strep, 1x (Catalog No. 15070- 063), and human recombinant insulin (Catalog No. 12585-014), also from Life Technologies. CellTracker™ Green CMFDA Dye (Catalog No. C2925) was purchased from Life Technologies. 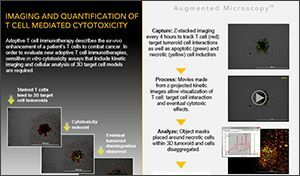 Cytation 3 combines automated digital microscopy and conventional multi-mode microplate detection providing rich phenotypic cellular information and well-based quantitative data. 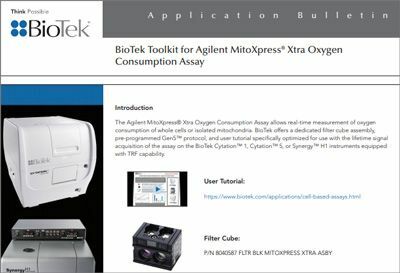 With special emphasis on live-cell assays, Cytation 3 features temperature control to 45 °C, CO2/O2 gas control and dual injectors for kinetic assays. The instrument was used to image cells migrating or invading to the bottom of the FluoroBlok membrane. 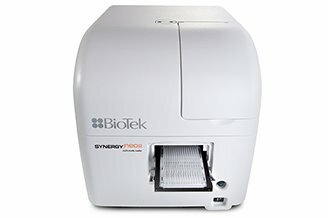 Gen5 software controls the operation of the Cytation 3 for both automated digital microscopy and PMT-based microplate reading. 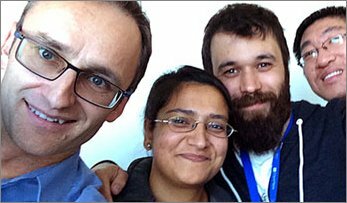 Image acquisition is completely auto-mated from sample translation, focusing and exposure control. Montage capabilities allow for the capture of images across the entire surface of a low-density plate well, such as the 24-well permeable supports used for this application. Finally, image analysis allows for cell counting with each image, and the reporting of total results from each well. 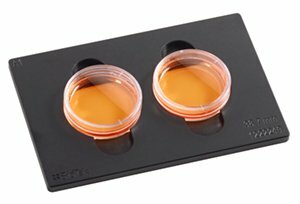 FluoroBlok cell culture inserts are designed with a polyethylene terephthalate (PET) membrane that efficiently blocks the transmission of light between 490 and 700 nm, allowing fluorescence detection in a simplified and non-destructive manner. 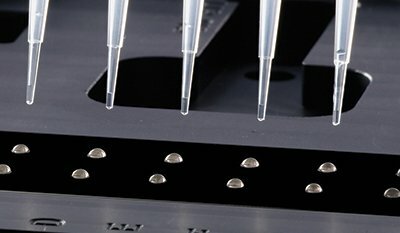 Fluorescently labeled cells present in the top chamber of the insert are shielded from bottom-reading microplate readers or microscopes. 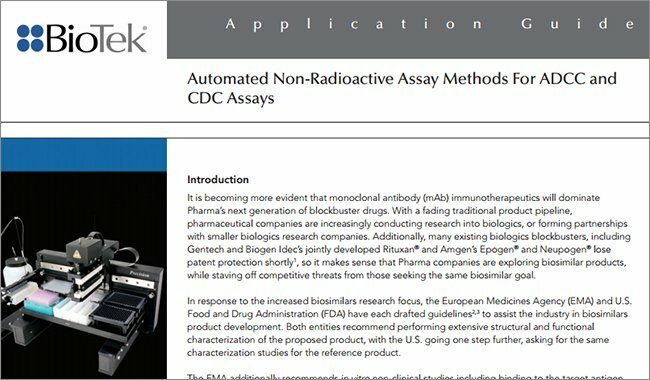 The non-destructive detection method enables both kinetic and endpoint migration and invasion assays. The FluoroBlok HTS 24 Well Permeable Support System (Catalog No. 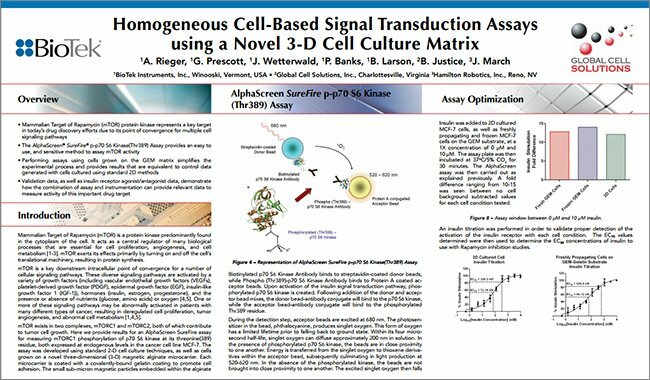 351158) was used for cell migration analysis, while the BioCoat™ Tumor Invasion 24 Well Plate (Catalog No. 354166), containing Matrigel basement membrane extract (BME) coating, was used to examine cell invasion. 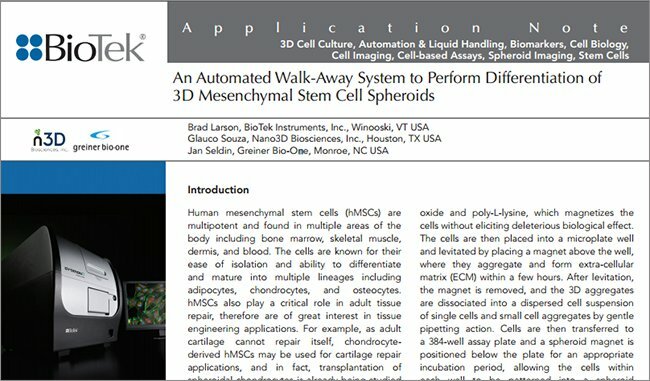 Cells were harvested and diluted in the appropriate serum-free media to a concentration of 5.0x105 cells/ mL. MDA-MB-231 cells were then labeled with a 5 μM concentration of CellTracker Green CMFDA Dye for 30 minutes using the manufacturer’s protocol. For cell invasion experiments, prior to cell dispensing, inserts were rehydrated with 500 μL of warm phosphate buffered saline for 2 hours in a humidified 37 °C, ambient atmosphere incubator. Buffer was removed following the rehydration incubation time. Serum-free media or media containing 10% FBS, at a volume of 1 mL, was pipetted into basolateral chambers, followed by 200 μL of cell suspension into the appropriate insert. 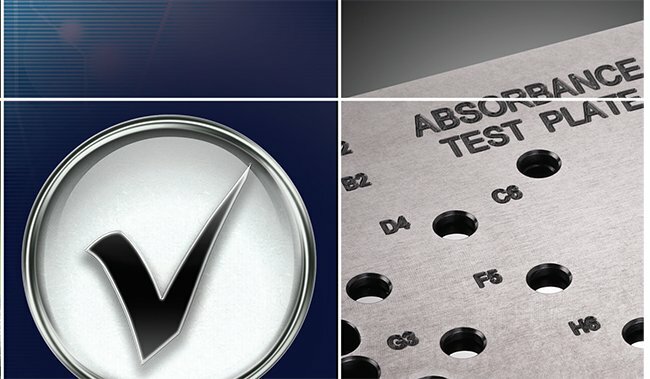 FluoroBlok™ plates containing media and cells were immediately placed into the Cytation™ 3, with temperature and gas control having been previously set to 37 °C/5% CO2. Imaging of each well was completed using a 4x objective and a four row by three column image montage. Focusing was carried out with the use of the brightfield channel, due to the fact that light is able to pass through the pores in the insert membrane. The Auto-focus feature enables the imager to focus through the bottom of the basolateral compartment up to the cell layer. The secondary channel was then set to detect the signal from the constitutively expressing fluorescent protein (RFP or GFP) from the cells, or the signal from the CellTracker Green Dye. A discontinuous kinetic procedure was also chosen where imaging was carried out with each designated well once every two hours over a 24 hour incubation period. Cellular analysis was performed using Gen5 software on the 4x images captured. This was done to detect the actual number of cells migrating or invading through to the bottom of the membrane, and ignore all other portions of the image. Tables 1 and 2 describe the parameters used to count cells with the GFP or RFP channels. Table 1. 4x GFP Image Cellular Analysis Parameters. Table 2. 4x RFP Image Cellular Analysis Parameters. The cells counted from each image within the montage are then combined and reported as a total count for each well at each particular point in time. From a visual analysis of the images captured from positive control wells containing 10% FBS, and negative control wells containing media with no serum, it is apparent that MCF-7 cells migrate through the 8.0 μm membrane in response to strong chemoattractants, such as serum (Figure 1), which has been previously shown in the literature1. Figure 1. 4x Montage Images of MCF-7 Cell Migration. Kinetic images taken of GFP expressing MCF-7 cell migration in response to 10 or 0% serum. Images captured using GFP imaging filter cube and a 4x objective. 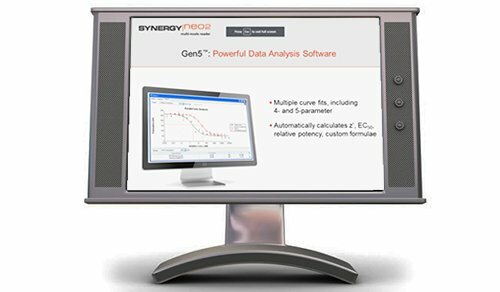 Analysis was then performed with the Cellular Analysis tool of the Gen5 Data Analysis Software using the parameters previously described in Table 1. Total fluorescence was also determined for each set of collected images. Figure 2. 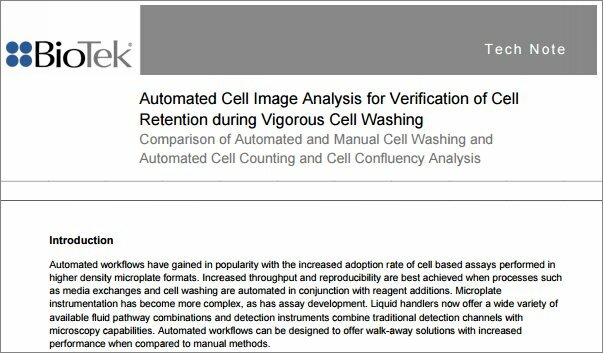 Image- and Cell-Based Migration Analysis. Cell count (A-B) and fluorescent signal (C-D) results from kinetic 4x montage images. The number of MCF-7 cells migrating in response to the 10% serum chemoattractant increases dramatically within the first four hours of incubation before reaching a more steady state of migration over the subsequent 20 hours (Figure 2A). This can be explained by the fact that initially, there are no cells in the pores of the membrane. Therefore cells are free to migrate at will towards the chemoattractant. However, cells most likely migrate at variable rates, with some taking longer to move through the membrane. After the initial 4 hours of incubation, there will still be cells working their way through the membrane. This has the effect of slowing down the overall migratory rate to a more steady state. This is in comparison to basal rates of migration which remain steady for the first 14 hours, on account of the much lower rate of migration taking place in negative control wells, followed by little to no migration over the final incubation period. When plotting the ratio of cells counted from positive control and negative control wells (Figure 2B), this creates three distinct phases of migration. 1. High initial migration in response to serum vs. steady basal migration; 2. Slower, steady-state migration towards chemoattractant combined with continued basal migration; 3. Sustained migration in positive control wells vs. no discernible migration in negative control wells. When examining the fluorescent signal results (Figure 2C), it can be seen that the values follow a similar pattern as those from the cellular analysis. However, the change in ratios between positive and negative control wells, using this method, are dramatically lower, reaching a maximum of only 2.4. 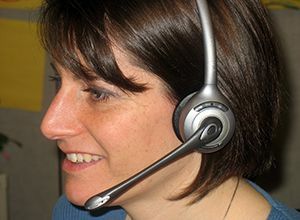 This is due to the inherent fluorescent background signal detected when using such an analysis technique. An outcome such as this may lead to false assumptions regarding the migratory ability of the particular cell type, or what the in vivo response would be to a particular chemoattractant. 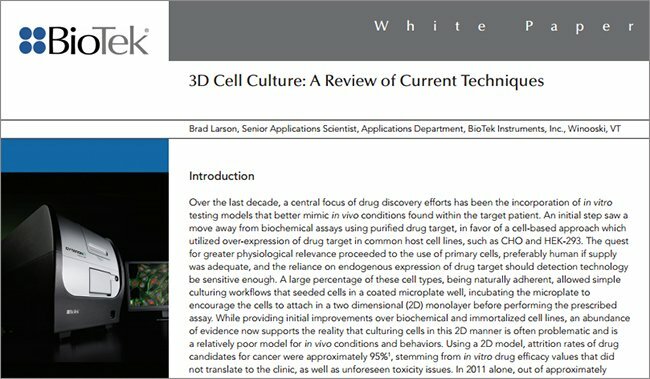 With the incorporation of an approach which can disregard background fluorescence, and focus solely on detecting actual cells, the true experimental outcome can be seen. Kinetic imaging was also performed to confirm the invasive ability of MDA-MB-231 cells2, using 10% serum as the chemoattractant control. Figure 3. 4x Montage Images of MDA-MB-231 Cell Invasion. Kinetic images taken of RFP expressing MDA-MB-231 cell invasion in response to 10 or 0% serum. Images captured using RFP imaging filter cube and a 4x objective. The number of invading cells was determined using Gen5™ and the parameters previously described in Table 2. Total fluorescence was once again determined for each set of collected images. Figure 4. Image- and Cell-Based Invasion Analysis. Cell count (A-B) and fluorescent signal (C-D) results from kinetic 4x montage images. The MDA-MB-231 cell invasion response to the 10% serum chemoattractant follows the same basic pattern as seen previously for MCF-7 cell migration (Figure 4A). However, the number of cells invading through the Matrigel in negative control wells remains low throughout the entire incubation period. This allows the cell ratio to increase dramatically over the total incubation period (Figure 4B). Results from the fluorescent signal analysis illustrate that RFU values from both the positive and negative control wells increase at a slow, steady rate throughout the entire incubation period. The net effect being that RFU ratios remain low, only reaching a maximum of 1.4. 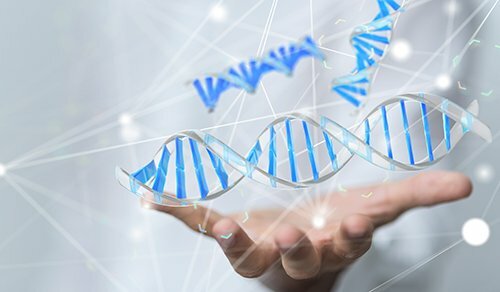 These findings may again lead to false assumptions being made regarding the cell line or the chemoattractant being tested. Not all cells used for cell migration or invasion studies will be constitutively expressing a fluorescent protein. 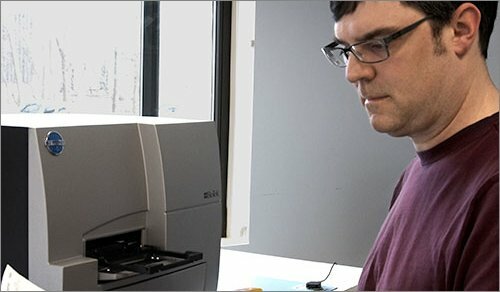 As such, it is necessary to demonstrate the ability to use the same imaging and analysis steps using a fluorescent signal from another means. The CellTracker Green dye is commonly used for long-term investigation of cell health and movement. 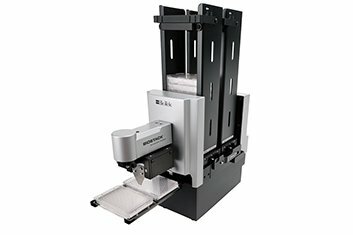 Therefore it is ideal for use with cell migration and invasion assays. The green fluorescent signal is captured with the use of the GFP imaging cube (Figure 5). Figure 5. CellTracker Green Labeled MDA-MB-231 Cell Invasion. Kinetic images taken of MDA-MB-231 cells, labeled prior to experiment with CellTracker Green CMFDA dye. 10 or 0% serum used as positive and negative chemoattractant control. Images captured using GFP imaging filter cube and a 4x objective. Invading cell numbers were once again quantified using Gen5™ and the parameters previously described in Table 1. Positive/negative cell ratios were calculated from invading cell numbers counted using the fluorescent signal from the CellTracker dye. 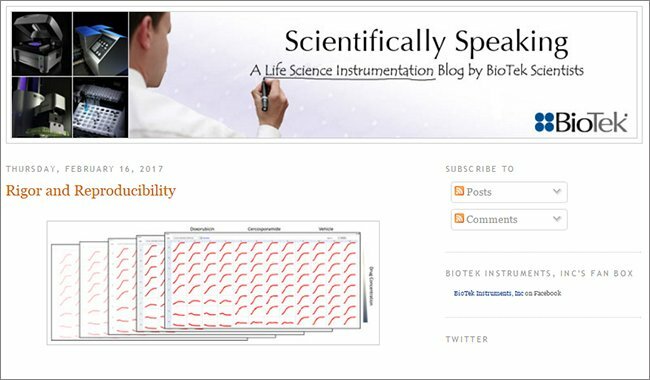 The results from the CellTracker analysis were then compared to those previously generated using the RFP signal. Figure 6. Fluorescent Signal Analysis Comparison. Ratio of cells counted from positive and negative control wells using either RFP or CellTracker Green signal. From the results in Figure 6, it is obvious that no loss of data quality is seen with the use of signal from a fluorescent cell label, compared to using values generated from a constitutively expressed fluorescent protein. Consequently, both are suitable for quantifying migrating or invading cell numbers. Here RFUi represents the fluorescence from cells invading through a basement membrane, RFUm represents the fluorescence from cells migrating through the uncoated membrane, and RFUb represents background fluorescent values. For the results shown here, taken from RFP data generated with migrating and invading MDA-MB-231 cells, background fluorescence represents RFU values calculated at time=0 hours incubation for each experiment. Figure 7. % Cell Invasion Determination. RFU (A.) and cell count (B.) values, in addition to % cell invasion calculations, determined from migratory and invasive RFP expressing MDA-MB-231 cells in response to 10% serum. In Figure 7A, meager raw fluorescence and Δ RFU values are seen using this analysis method, due to the fact that fluorescence from red fluorescent proteins is usually weaker than that from other more green shifted proteins. This can serve to potentially skew the final invasion percentage. When substituting cell count numbers into the same formula (Figure 7B), it is evident that lower % invasion values are calculated, which may be more indicative of the actual in vivo outcome. 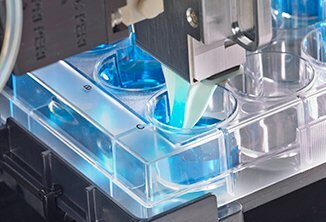 Corning FluoroBlok cell culture inserts represent an easy-to-use, robust, representative method to determine the migratory and invasive characteristics of cancer cells. 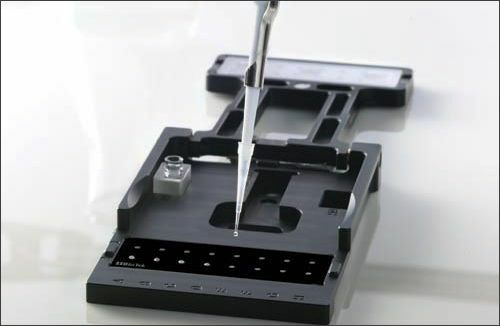 The insert design and integration of a fluorescence blocking membrane make the plates ideal for use with the Cytation 3, because of the instrument’s capability to automatically focus up to the cell layer. 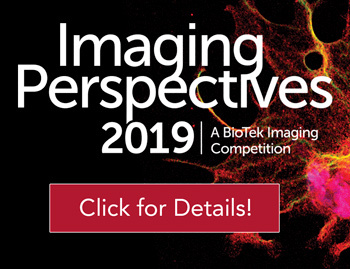 With the incorporation of temperature and gas control, as well as the use of brightfield imaging for focusing, longer-term experiments can be performed to determine the appropriate incubation time for the cell type and chemoattractant being examined. 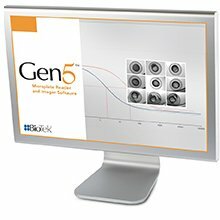 Finally, the cellular analysis capabilities of Gen5 allow for determination of the number of actual migrating or invading cells, which can yield more accurate information being gleaned from these important experiments. Prest, S.; Rees, R.; Murdoch, C.; Marshall, J.; Cooper, P.; Bibby, M.; Li, G.; Ali, S. Chemokines induce the cellular migration of MCF-7 human breast carcinoma cells: Subpopulations of tumour cells display positive and negative chemotaxis and differential in vivo growth potentials. Clin Exp Metastasis. 1999, 17, 389-96. Doerr, M.; Jones, J. The Roles of Integrins and Extracellular Matrix Proteins in the Insulin-like Growth Factor I-stimulated Chemotaxis of Human Breast Cancer Cells. J. Biol. Chem. 1996, 271, 2443–2447. Partridge, J.; Flaherty, P. An In Vitro FluoroBlok Tumor Invasion Assay. JoVE. 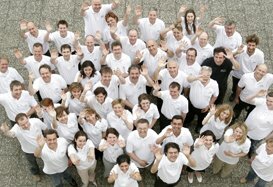 2009, 29. http://www.jove.com/ details.php?id=1475, doi: 10.3791/1475.